As if I needed to remind anyone, but today is the final episode of LOST, I can't believe I just typed those words, but the reality is drawing ever near. It seems contradictory to say Happy LOST day, but I might as well one last time. Here’s a message from one of our regular contributors to all LOSTARG’ers & LOST fans who would like to assist in putting together the ULTIMATE LOST Auction Basket to benefit a charity called DCU for Kids. You’ll also have a chance to WIN Tim Doyle’s “Hurley’s Numbers” (68/300) – yes it is one of his extra prints released with a “Sweet Ride” doodle! Click on johnlahair.blogspot.com for a complete description of the Auction Item Request and the contest. Good morning Chris, I'm all excited and sad at the same time. Quite honestly... I'm in denial. It's not over.. I won't have it! Nice auction ideas JPL... I have something to add to it and will email shortly. Thanks for keeping this all together for so long Zort. hmmm. 'awsome news'? i think the best we can hope for is another print run. how great would that be! but i m not getting my hopes up. Right, time to wear a black outfit. Sure, it doesn't end until tomorrow night for me but today is the official end. It is sad. I'm glad I don't watch 24, because then that'd be 3 series finales in 4 days. Ashes to ashes ended on Friday in very confusing but satisfactory style. That's right, a lost fan found ashes to ashes confusing. Right, time to get up and enjoy this beautiful sun. Minutes silence at 1:08PST as it is 21:08 in the UK. 2 108's make a right! Today is my last day on the internet before I avoid it (and everyone else in the world) until Friday.. Gonna be a tough week! Gonna have to avoid watching it tomorrow morning (for various reasons) even though I'll no doubt be awake with this heat! That Olly Moss tweet is intriguing, I wonder what it might mean. Perhaps damon and Carlton have signed all the posters as well as Olly ! Joe, why not just record the 5am showing? Granted, i'd be up at 5am to watch it if my gf were here tonight but she can only come back tomorrow night. So i'm recording it and watching it. I think someone also said there's no commercials either. Joe, good luck in avoiding the internet, newspapers, TV and anything else that might spoil you it's rather a large task you have there. I'm going to watch at 5am, and the moment it finishes I have to get in the car and go to work, no matter what the ending ! Martyn, I'm fairly sure there will be commercials, the only odd thing is they will be at the same time as the US ones rather than Sky butchering an episode. Maybe start recording at 5am and start watching at 5:30 to fast forward most of them. There are a lot of things finishing this week and the next few, I might even get to do something that doesn't involve a computer. RE Ollys news, what about a book or mini prints with the DVDs. Maybe box art work its self. Nuts! but I guess I wanted commercials this time around, but wasn't prepared to wait until Friday for it. I can't remember the last time I watched LOST with commercials. Maybe season 1 I think. Happy Last LOST Day & a proper Good Morning To You All Everybody! Second, please remember that if you are unable to contribute a LOST item or other auction item... you may still enter to WIN - this contest is open to all fans regardless if you donate. Lastly, although nothing lasts forever, memories and friendships are the two things that definitely withstand the test of time & boy do we have those. Thanks Callum, I think those two were on after the episode on Friday. Man, today is the wrong day to wear black! I think i'm going to abandon my plan and wear something cooler. Right, today, i'm going to breeze through episodes 4-16 of LOST, all in prep for the finale. I'm interested to know what happened, so seeing as you're here, spill the beans beeezy!!! I was at the NY UCB show. Overall it was pretty bad, with most of the comedians throwing out different versions of what were essentially the same jokes. Our only Lost guest was Samm Levine who did a really hacky sketch where the joke was that he came up with sitcom spinoff show titles for his character, and all the titles all had the word "cluck" in them. 30 min clips? I will not be able to see them, 'cause i will watch the finale in Fox italia channel. Will anyone record and share them? *sniffle*sob* My heart is breaking. We have a collective shoulder for you to cry on andalone. andalone... we're here for you. We're in a mess too but, we're here for you. Too true! I made pancakes to cheer myself up! Didn't work. Doe's anyone else think that there is still one more poster to come? Although the Olly poster felt like it brought Finality, I still feel as if they have one more thing up their sleeve. You know, I thought they'd do a finale print too but the more I think about it, the more I think they won't. This was all about finality and bringing an end to the whole thing, it seems crazy that they'd do the first series, end it, bring it back for a second series, end it, then do another print afterwards. And Jensen tweeted saying Olly's was the last LOST print. Further proof that LOST is more than just a TV show! I highly doubt there are any other shows that will bring together great people like yourself and others, who help each other out, even though they've never met! Lost is dead! LONG LIVE LOST! Good morning from DFW Texas and happy series finale LOST day to all. I was disappointed in not getting an Olly Moss print yesterday and did not have a good day. Today I woke up and realized that The End is very near. It's been a tremendous ride. I had the extreme pleasure of watching the pilot when it first aired and haven't missed an eps of LOST since. I was involved in the first ARG, the first poster series and now this poster series. I just want to say that today should not be a day of mourning, but a day of celebration, LOST style. 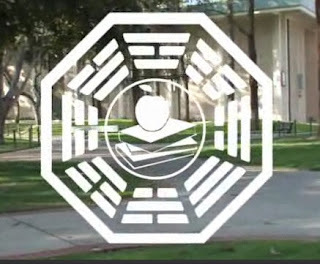 Enjoy the last 2.5 hours of LOST, Namaste and Good Luck! Oh, and if any one has an extra Olly Moss they don't know what to do with, hit me up at JGZ350 at gmail dot com. the people of Lost have become my friends and I think one of the reasons I'm so down is when your involved in something like this, people seem to disappear when it's all over. I sure hope that doesn't happen. But.. I do have alot of you on facebook so we can keep in touch that way and when ever you find the reason. I've loved every minute of it and you have all been and are great friends that it has been a Honor to get to know. 1) Opened up with 3 dudes in dharma suits drinking beers and warming us up and chatting about life on the island. They were pretty decent. They all wore Frank Lapidus shirts. 2) First act was a guy who was supposed to be a dharma janitor. He did standup complaining about life on the island. It was alright. 3) Then they did this thing with a UCB guy planted in the audience who said he was on the plane. He was that guy we always saw "gathering driftwood" and tried to convince everyone he was friends with everyone on the show. It was kinda awkward and got old fast. 4) Next skit was a guy dressed up like Eloise Hawking. He built a makeshift donkey wheel on his belt and pushed it to go back in time or forward in time to answer audience questions. Each time he would have a nosebleed. It got weird by the end. 5) Okay I think I messed up the order already, but some guy came out pretending to be Jim Leyland from the Detroit Tigers. It made no sense and I think people started getting nervous at this point about the show. 6) Then they brought out another random standup comedian who just made Lost jokes. Not good. 9) The last thing was with Bobby Moynihan. He decided to scrap his bits he had been practicing and made a slideshow of himself with his LOST memorabilia. I thought it was actually pretty cool because he admitted "I'm totally just going to geek out here and embarrass myself and show you this". Pretty cool and props to him for showing off his stuff and his favorite picture memories. He's a much bigger fan than I thought! Also, Damon sent him a letter because he saw how big a fan Bobby was on SNL (he wore his Dharma sweatshirt a few times) and sent him the entire first print series and invited him to Times Talks. Also, where were you guys watching the show from? I was sitting on the floor in the center by the stage right behind a couple of people, just to the left of the center column. and yeah, what's the deal with Olly's tweet! I like that idea that it could be the Season 6 artwork! Interesting tweet from Olly, maybe there will be a second run of his LOST print or maybe a print from the finale. Which print will sell out next??? I think the Candidate Cave will sell out next. I guess I should pick one up before the finale as I have a felling that once The End is done with alot of stuff on DCAAPB site will start to move. The Kate and Claire print is looking better and better every time I see it. I'm having a tough time choosing between the Candidiate Cave and Kate and Claire. The scene from Kate and Claire is definitely one of the scenes that stands out for me from Season 6. You know the rules. You can't buy it! It's got people in it. Olly'd and Danger's print are still in "preorder". yeah I know Martyn this is what has me stalled on pushing the button. lol stupid really we shall see what I feel when I get home tonight well, this morning. I will be leaving for the Lost party in a hour. I just made a ton of buttons and necklaces to take with me and grabbed some other stuff. I will put up photos when I get back tomorrow. Ugh, I want a fish biscuit now! They look so good! lol they are Martyn they are just sugar cookies with food color to make them that orange. Got my drive shaft pins which I will pass out at the party too. Do they look ok ? Wow! I'm sorry you New Yorkers had such a bad time... The LA show was amazing... Paul Schear and his partner were hilarious! They had many skits they did and kept the crowd laughing. As a special suprise Damon and Carlton were there the whole time. We also had Eddie kitsis, Adam horowitz, Noreen, Sam, and Greg nations. Eddie, Adam and Greg were all parts of skits. Sounds awesome! I also saw MIB was doing a Pacino impression, very jealous. I liked the DS pins too, and the Oceanic one. I think I just got too distracted by the fish biscuits. I saw one with the sugar glistening and began drooling. So, went and started another BBQ so I can eat. According to my iPhone, it is hotter here than in New York and Honolulu. But I imagine in NY it is quite muggy anyway. I liked the NY show a little bit better than you guys did, I guess. Zombie Sayid and Zombie Claire were great, and I thought the Eloise Hawking skit was pretty damn funny until the end, too. Bobby Moynihan's bit was wonderful, if just for the fact that Damon SENT him the entire DCAAPB set. And I ran into geekboypress on the street after, which was excellent. Can't wait to pick up some of his Etsy prints after my wallet calms down. Yeah, I definitely enjoyed myself - I think I just came off as groggy since I didn't get home until almost 4am! Have a GREAT day guys! I'll be heading to Costco soon to pick up mass amounts of Dharma food. Can't believe its almost over! Our UK Dharma party in full swing! Did the DI serve Pimms? Probably not in the qualtity I've consumed this afternoon. quantity even. Bit of a give away that! 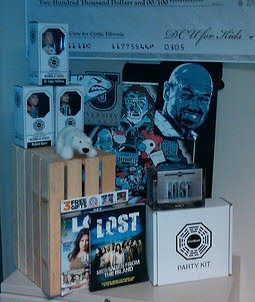 Happy Last Lost Day (as if we're really happy)! Trying to stay spoiler-free today...even Damon has warned us that there are spoilers out there and he's not happy about that! Also he said he had a sleepless night like I'm sure many of us had! @weinbeezy: Wow...sounds like an amazing experience last night. Good seeing you last night at the party before you guys headed over there. Hope some of that ends up online somewhere. Pretty sure Horace did. Just don't go playing with dynamite! Happy Lost Day! Can't wait to watch the last episode today. I envy you guys who live in the US and saw the skits. Happy Anniversary Amy Lynn. Great gifts! Actually, one of my favorite quotations from last night it: "Richard's Social Security number is one of those Egyptian bird symbols." Happy Anniversary Amy Lynn, happy Lost Day everyone! I'm on my way to my parent's house in a bit as I don't own a TV. I think this is a good time to go in to internet LOCKDOWN. Will check DCAAPB at 1:08 and if anything happens i'll be back. If not, Happy LOST Finale Day to you all! I hope how ever you choose to watch The End is fantastic and you never forget it! Thank you to everyone i've come to know and love and consider great friends. Made the last 9 months awesome and allowed me to reveal my true LOST geek! I shall see you all on the other side! 10 hours of work to get through tomorrow and then I get to sit down and enjoy the most anticipated Finale since Life on Mars, for me anyway, with my girlfriend and parents. Perfect! @maven.. Good seeing you too!! @Amy Lynn: Happy Anniversary on the Lost Finale Day! Wishing you and your hubby all the best! Martyn. Top Man. Enjoy. I'm going to hang around for a few more hours before I switch off until tomorrow night. Talk about heart attacks: at 10:08 an Olly tweet popped up, but not of any Lost concerns! Two minutes later, a Jensen tweet, also not of any Lost concern. There's Kimmel tonight and I think they are trying to get all the actors they can possibly get there. To LA folks: Who are the Fine brothers, and why did Damon revoke their status as fans? @amylynn there a group of guys who do like a parody with action figures. And they basically talked crap the whole entire time during their skit piece at UCB LA. Happy Last Lost Day all! There are Lost T shirts all around here at the LA Omni-a nice celebration with instant friends. My thanks to you all too- especially Zort of course-I wouldn't be going to the J&J show tonight - or have enjoyed countless other Lost moments-without your help. So Happy Aniversary AL- Namaste Martyn-I'll keep checking back Zort- guess we'll all always be a little Lost. It's been my pleasure (mostly ;-) ) to host this little shindig. The people are the most important part of the puzzle and we have had some of the best here. It'll be pretty low-key for me tonight. I'll watch with my kids. We'll break out some t-shirts, my Dharma koozie, and a few other LOST goodies to help celebrate. Hello to all my LostARG friends. Happy LOST finale' day. Can that really be true? Sorry for the unintended impersonation above- borrowed laptop- Sam is actually Just Thinking! Just out of interest, does anyone have any of their last series prints framed and does anyone have any pictures of them? I'd be interested to see how people had them done. Came to the newest print series a little late in the game, and sadly missed the Moss drop yesterday due to my sister's birthday. If anyone would like to trade/has one to sell, I have a mint condition BEN LINUS PRINT by Todd Slater (and it's print number 108! I'll send pictures ahead of time if you'd like the proof) to trade. If you'd rather not trade, I'd be willing to pay $100 plus shipping for the print. Email me at tmarasco125@gmail.com if you're interested! Thanks! @LisaM - Nice biscuits! I feel a little naughty saying it like that, but I think you know what I mean. :) If I could, I'd drive up to NH to party w/ the rest of the New England crew. Sounds like Jensen is at it again... a 1:08pm tweet... does he not know what we're going through? Donated to lostathon.com & they looked great on Good Morning America. So much going on for a day that we should be chilling. I'm doing a finale marathon. All night long i will watch lost (i'm at episode 5 now), until the finale, tomorrow at 6AM. I might just do that myself actually. I'm beginning to feel terribly sad. Olly probably means that it was some personal good news about his poster. It probably doesnt affect us. ...unless it's about the poster being made into a t-shirt or something non-poster. My AP editions numbered 1-50 of Yesterday's lost print will be available next month. we must be on the same wavelength! Olly just tweeted that his copies will be sold next month. Got to love Twitter & following these guys. Except for Jensen on occasion... his tweets scare me more than Claire's Squirrel Baby & Flocke combined! you should have seen squirrel baby last night. Looked like a combination of Wilson from Cast away and a fetus. Happy L O S T finale day to everyone here! If they put Squirrel Baby up for bid at the Profiles in History Auction... I say we as a group collectively bid and adopt Squirrel Baby. The LOSTARG's family (dysfunctional at times like any other family) would make proud surrogate parents of Squirrel Baby. Zort has diaper duty first! Haha I seriously would put in for that! Guys, Olly's tweet does not mean they are printing more. I for one would be very angry to find out they were, considering the site says " Once this limited edition print has sold out, they will never be printed again. " Imagine all the people that just shelled out 300 bux for the print, and then they go and release 500 more? Major backlash, at least from the poster collecting community, they hate that kind of thing. It probably means its going to be the Season 6 artwork, or maybe some of the prints will be signed by random cast members, or who knows, could be anything. @Midday - Right back at you! @Ray - time to start petitioning. KEN TAYLOR did an amazing job. I just rewatched Sundown. He depicted PERFECTLY Kate and Claire's faces. @Davide - can't wait to get mine. Hoping for gold ink! #ThanksToLost I've decided to petition @CarltonCuse @DamonLindelof to allow fans a chance to adopt #LOST #squirrelbaby Please retweet! Off to shop for tonight. The hour is fast approaching. Later! I thought the same thing earlier when I watched it. Claires face is spot on. I'm currently on Ab Aeterno in my S6 rewatch. Think i'm going to load a couple on to my phone to watch while i'm at work. Only come on to buy the teefury tee and see if anything happens at 1:08. If not, it'll just be a minutes silence, giving thanks to the 6 great years of LOST! They are just releasing the 1-50 of "Lost" print Olly did. I'm officially checking out until late tomorrow night then. Enjoy this great moment all of my wonderful LOST friends. It's been quite a ride. no doubt some of you will be here in 24 hours to share thoughts, those of you that aren't... thanks for making this past year so special for myself and for Alice. Zort. You are a star. Thankyou. Game over, no surprise reveals going on at DCAAPB.com 1:08 PST. Going through F5 withdrawal. I need some Dharma beers to take the edge off. Oh well, next month when Olly releases his copies, I'm sure the hype will have died down and maybe this time I will be in front of my notebook when he drops his 50 APs. I came from Philly for the NY show last night and had a good time! Kinda sad no Jorge or Michael, but hey...Sam Levine! (who doesn't like Freaks and Geeks?) Loved Bobby's Lost collection and his experiences with Damon and Jorge. It was awesome to meet Amy Lynn and her boyfriend in person. Funny how your interpretation of people change once real life enters the equation. If i ever tell my GF i'm doing a LOST marathon for ALL night long, i think i could be single the day after i'll tell her. Thank you to "You All Everybody" at LOSTARG's for what has been amazing 9 months. Had a lovely brunch at the Omni this morning with LT, Scoutpost, Just Thinking, ObFuscate, MEL, PatMC, David R., David, Josh, Jonine. When I left (I'm watching it at home tonite with hubby), I realized it was my last meet-up with my Lostie friends...very emotional. And, liftoff on the East Coast. When it's over, i'll see it again via fox italia. The Smoke/Flock shirt sold out a while ago. Oh man. I feel so terribly sad and empty. I no longer have lost to look forward to. I won't comment, to avoid "spoilers". Pat on the back to all the losties. Enjoy, West Coasties and Europeans! I really liked the way it ended however, I'm still sort of confused and I think some people will be upset and want more answers. Very satisfied! Thanks for all the fun everybody! Until the NEXT series of prints... god, I can easily think of 8 amazing prints based on the finale. Maybe I'll just do some on my own, I do make my living as an artist, after all. Morning love and peace to all. Hey all. Sorry if this is the wrong place for this, but I purchased 2 items from DCaaPB for a friend, who bought the items herself and forgot to tell me! I've opened up a final (for the moment) NEW POST for any discussion on the finale if you want to use it. BTW, I've decided that if anyone on this site has a Locke's Secret they're willing to trade me for the LOST Olly Moss print, feel free to email me at: unseenpresence at gmail. I don't expect that to happen, but you never know. Zort, I'd still love it if we could get one post about people still looking for prints. One last attempt to get good LostARGers what they truly love. I guess this is the post for print/non-finale related talk? My print orders are all still on pre-order FYI (earliest one I bought was Black Rock). My shirt turned to "queued" before it shipped, so I guess we should expect the same with the prints? Hopefully GoMerch gets them in stock soon! I wonder what the print counts are for the remaining posters. Anyone know that coding method to check?